Enlist & train operators to run video for worship. Discover people with tech ability that can utilize their gifts in this way. Train your computer operators on the software they will be using in worship so they are comfortable enough to navigate through times you veer off the “written plan.” (See post, When God Shows Up, What Happens to the “Order of Worship?”) You need to relay expectations, including attendance at needed rehearsals (no on the fly presentations). Construction of complete order of worship with tech notes clearly showing all media needed, songs, etc. and clear directions as to how these are to be used in the worship service. All songs with correct lyrics in the correct sequencing entered in worship software. Videos from the Worship Planning Team, missions team, pastoral staff, etc. prepared in proper sequence and in proper format (no streaming allowed, unless live video). 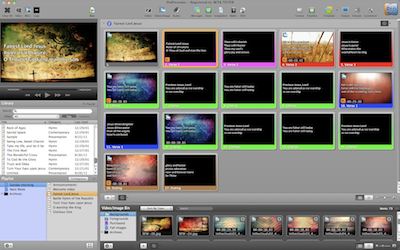 Insertion of PowerPoint, Keynote, or other media to support sermon. All Scripture passages from the translation being used by the presenter. Any readings or other congregational involvement needing media support. What are some additional items that need to be considered? Next week: coaching the worship leader through the process. Take a look.